WHAT with the Taoiseach being compared to Hitler, the Vatican throwing a hissy fit and the rest of the world enthralled at little Catholic Ireland standing up to the big boys in Rome, perhaps it's time we asked: "What would St Patrick do?" Not the snake-slaying, shamrock-waving bishop of later invention, but the Patrick of humanity and pragmatism, with all his foibles, failings, loss of faith, love of women and bloody awful Latin. Because, since the Taoiseach fired the first official salvo against Rome, the Irish Church seems to have been mobilising itself for a schismatic war. As Catholic commentator David Quinn noted: "It is as though we are now being asked to choose between the Roman Catholic Church in Ireland, and the Irish Catholic Church. Catholics in the past have had to make a similar choice. How will we choose?" "Bishop Willie Walsh, Fr Enda McDonagh, and the Jesuit theologian Fr Gerry O'Hanlon, among others, have advocated the idea of an Irish synod involving clergy and laity -- and, God bless us, women too -- to map out the future of the church. As O'Hanlon has noted: "It will not do any more for priests, bishops, cardinals, the Pope to simply tell us what to think, what to do. People rightly want a say." Is this heresy, or just a return to the church of our ancestors? ..."
..."What would the humble, nomadic Patrick we know from his Confession do? Would he support the Church of Rome in its attempts to retain control of its empire? Or would he advocate a return to the simple, spiritual yet pragmatic practices of the early Irish Church? Once again, the Catholics of Ireland are outraged and leading the way to reform and renewal of our church. 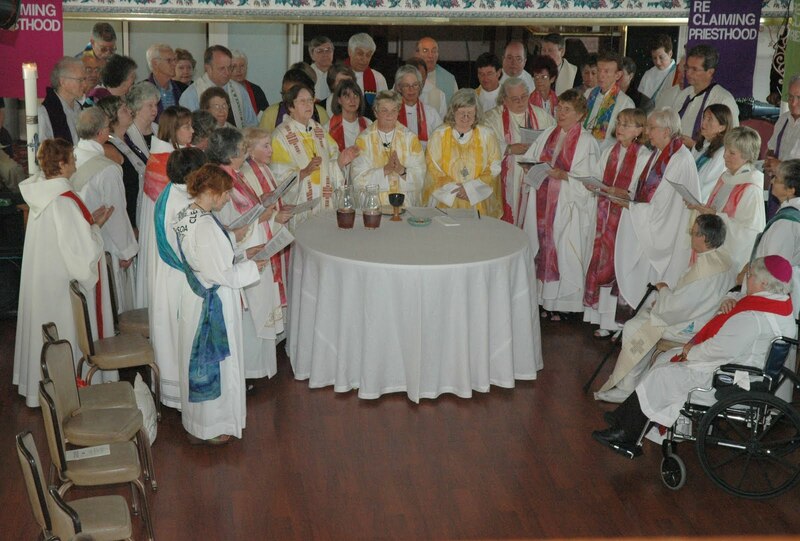 The Synod of the Laity is a hopeful sign especially if it addresses the issue of women priests. 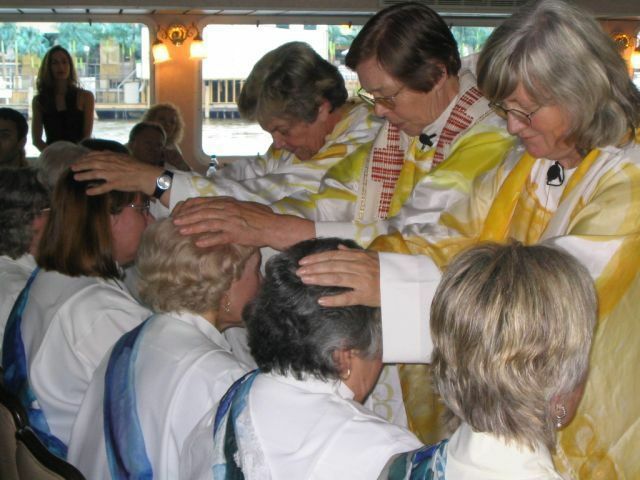 The German theologians and Austrian Priests are also open to women priests! Now it is time for the Vatican to get on board! "Guilt shortage dooms reform of the reform"
..."Catholics cut down on confession not because they abandoned the idea of sin but because they discovered the meaning of sin and realized that it was much different in many of its social dimensions than the personal foibles they had been trained to feel guilty about in the pre-Vatican II Church. The Reform of the Reform is therefore doomed because it can no longer make healthy people feel unhealthy and unnecessary guilt about being human. That is why, when once asked why he convened Vatican II, Pope John XXIII replied not with a discourse on the sinful world but with perhaps the most Catholic sentence spoken by any pontiff in the 20th century: "To make the human sojourn on earth less sad." [Eugene Cullen Kennedy is emeritus professor of psychology at Loyola University, Chicago. I attended my 45th high school reunion this evening for the class of 1966 at Bishop Denis J. O' Connell in Arlington, VA. One of my classmates did an informal survey of our class and found two practicing Catholics. Several women reported that they had longed for women priests and applauded the courage of our Roman Catholic Women Priests Movement leading the way to equality in our church. 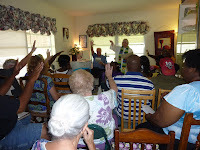 Both women and men affirm a more open, inclusive church! I am sure that the classmates that I met this evening would love this article on Catholic guilt by Eugene Kennedy. Voice of the Faithful is supporting an Open Letter to U.S. bishops about beginning a dialogue surrounding optional celibacy that could help alleviate the impending crisis in the number of our priests. Several priest organizations and national church renewal/reform groups also are joining this effort. 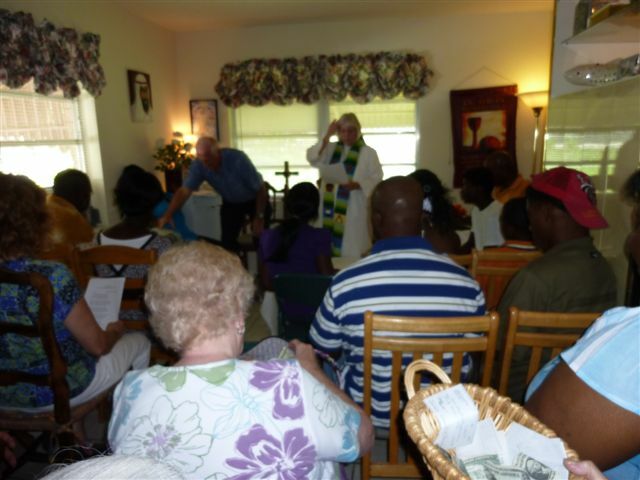 Studies show that half of the 19,302 active diocesan priests plan to retire by 2019. We are ordaining about 380 new diocesan priests each year. If the rate of ordinations remains constant, as it has for more than a decade, we will have only 13,500 active diocesan priests to serve our 18,000 parishes in just eight years. To sign the Open Letter online, or to download paper copies to circulate among family and friends, or to download a free organizing kit, click here. Only your name and diocese will be included in the online listing if you wish, or you may remain anonymous. The Open Letter will be published in one or several national Catholic publications in 2011 and 2012. Every effort will be made to contact individual U.S. bishops and officials at the U.S. Bishops Conference. If you wish to read about VOTF's position on optional celibacy, click here, and then click on the Optional Celibacy link, which will be in the list of links to reports and presentations that were made during VOTF's National Meeting in Detroit last month. We hope you will join us in supporting this important effort. "...In the case of Father Bourgeois, the priest who is calling for the ordination of women, Call to Action has sponsored his 34-city speaking tour, called “Shattering The Stained Glass Ceiling,” which will conclude in September in downstate Belleville. The Vatican maintains that even discussion of ordaining women is a violation of Catholic teaching. The authorities of the Maryknoll Order, based in New York, sent a letter to Father Bourgeois in March demanding that he recant his public statements or be dismissed from its ranks. 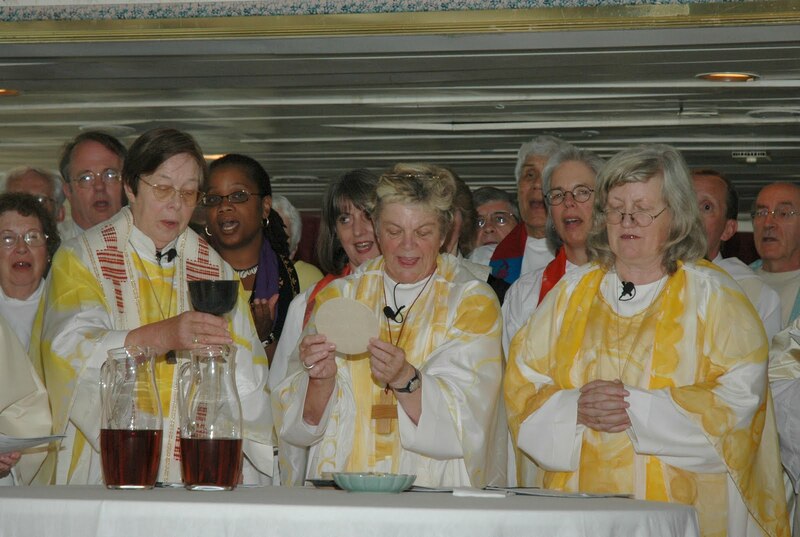 Roman Catholic Women Priests and the communities we serve are shattering the glass ceiling now. Fr. Roy Bourgeois, who attended Janice Sevre-Duszynska's ordination in Lexington, Kentucky three years ago has had a major impact on both people and priests across the country as he shared his story of support for women's ordination. For Fr. Roy, it is simple and tragic. Sexism, like racism,is always a sin. Now the big news in 2011 is that more male priests in the U.S. and Austria are going public with their support. So are theologians, bishops in Australia and Switzerland and even a cardinal from Portugal. The holy shakeup has begun and the Vatican is powerless to stop it! Catholics are ready for women priests now! We are getting calls from enthusiastic Catholics who are looking for female priest led liturgies. A new day has dawned for equality for women in the church! the feeling of community at Rev. Judy Lee’s Church: the Good Shepherd Inclusive Catholic Community.Such a nice time and place to celebrate Mary of Magdala’s feast day. She leads a unique mission for the homeless yet I also met University Professors, a group of young people who had attended the Bible Study Camp and every day neighbors who make up her congregation. About 45 people were present in the small building where all are welcome. tell the story of love, honor, and devotion to Jesus that made Mary of Magdala the favorite and most loyal of the Apostles. Jesus loved her. She understood what he was telling the world. She was loyal and was the Apostle who stayed by Jesus as he endured the crucifixion and his death. that Jesus appeared to and told her to go tell the rest that he was resurrected. The rest were in hiding in fear. Her courage was noted. 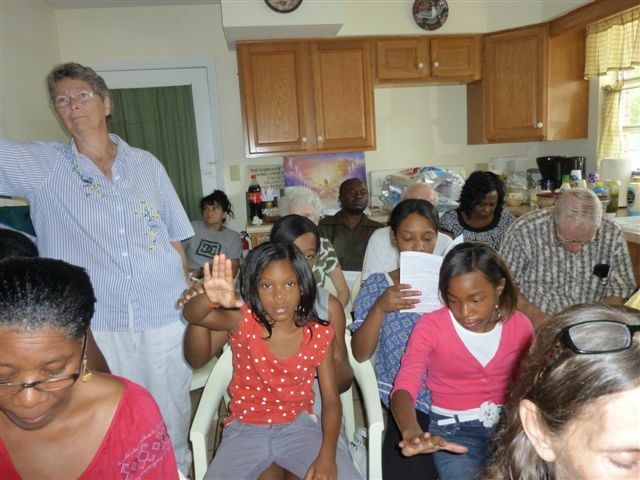 The young people also told about Miriam, Mary of Bethany, and Lois and Eunice as the people replied: "We didn't know" their stories. Pastor Judy's 17 year old teaching associate, Efe Cudjoe, then led the congregation in a ritual of being called by name. and other women in the Scriptures were about. Bishop who turns his back on our female priest and this mission. ..."However you cut it, there is something quite disturbing -- and immoral -- about a debt reduction package that calls for cuts in critical services to the poor while at the same time calling for no sacrifice from the wealthiest elite in our nation. This, of course, is one more sign, if any more were needed, of a well-heeled and finely purchased Congress by the super rich among us. It’s quite sad and should be upsetting to all who support democracy around the world. Those in Congress who justify this disproportionate solution to our nation’s financial predicament under the banner of “no tax hikes” should be ashamed of themselves. However, don’t expect any self examination of conscience soon. 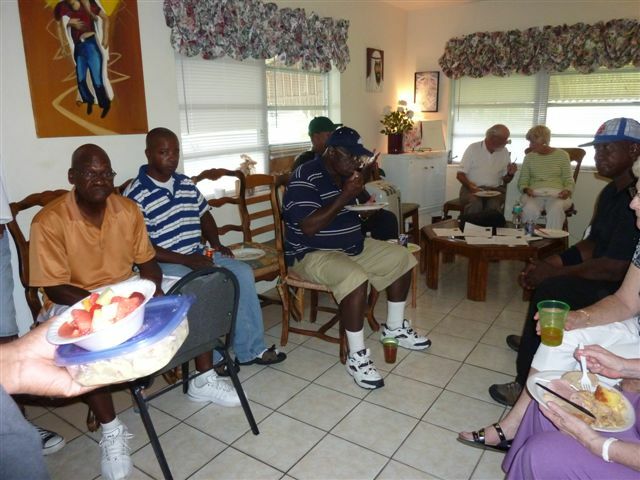 These folks swim in waters of sweet justification and self-satisfaction never inconvenienced by information or reason. Simple self-justifying ideology, fanned by those who most benefit from it, the super rich, propels them either mindlessly or blind to conscience.After all, they apparently continue to look into the faces of their children without embarrassment. Keep in mind the very modest tax increase that was initially on the table, the long needed elimination of a tax break to the top one percent of the nation’s already very well-off asset gatherers, was forced off by political reality before serious negotiations began to take place. rich and poor has expanded at an alarming rate. " As people of faith, we should come together to create a lobby that will shift the dynamics in Congress that favor billionaires. As people of faith we should demand justice for the poor and oppressed as a core social justice value that the majority of people of faith share. "Religious life for the majority of U.S. sisters is at a crossroads. An aging membership and a decline in new vocations have communities probing what to do next to sustain their ministries and their way of life. These women sense a new era is emerging and they have decided to embark together on a new way of discerning that future. When more than 600 sisters gather in Southern California Aug. 9-12 for the annual assembly of the Leadership Conference of Women Religious, they will set aside discussions on strategic planning and talks about mergers and consolidations. ..Instead, these leaders of the 334 congregations in the Leadership Conference will sit together in silence, discovering what God is calling forth for religious life today. They will have no expectation of a particular insight or result. Rather, they will spend time in collective contemplation to explore where religious life in the United States may be moving." "Time for Nuns to be Priests Publically"
May Spirit Sophia lead and guide you into your future! It is time for nuns to be priests publically. You have been doing it for decades! The full equality of women is the voice of God speaking in our time. Sisters, we are ready for you !The Association of Roman Catholic Women Priests invite you to walk on water with us! 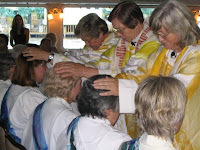 Let us rejoice on the fifth anniversary of the historic ordination of 12 women, 8 priests, 4 deacons in Pittsburgh, PA. on July 31, 2006. God has done great things for us, we rejoice, indeed!